(original kept by the Avgust Černigoj Gallery at Lipica Stud Farm). 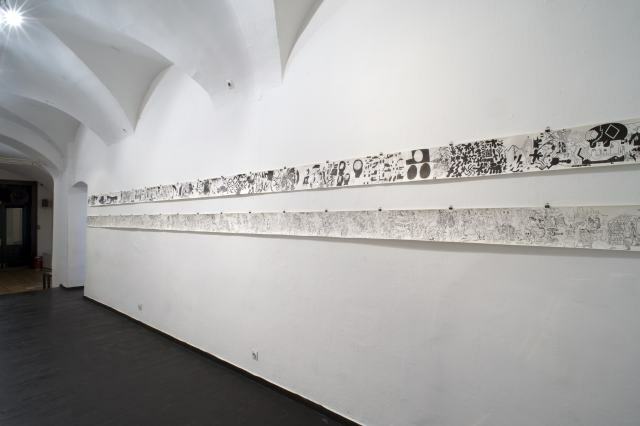 The Day by Day exhibition focused on the exploration of drawing in the form of a diary entry, drawing that is therefore produced in a more or less organized sequence and records daily impressions, ideas, memories or flow of thoughts. 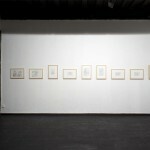 The drawings were produced in different situations (the hustle and bustle of the daily life of a 4-million Turkish city, the domesticity of the early morning ritual of drinking tea, the hospital and rehabilitation centre …), on various supports (from shop receipts, diaries, scraps of paper of different sizes and colours, rolls of paper … ), during different times (the most recent stemming from the time of preparing the exhibition, the oldest dating from the mid-1970s). 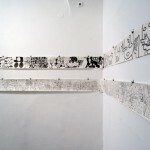 The drawings thus composed a cacophonic image of the personal and public worlds of the five participating artists, intertwining with one another from time to time. 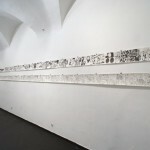 The Beli sladoled (White Ice Cream) art duo showed their piece Don’t Look Back (2012), a 21 metres-long drawing, which was actually an experimental test of a different, new way of collaborating. 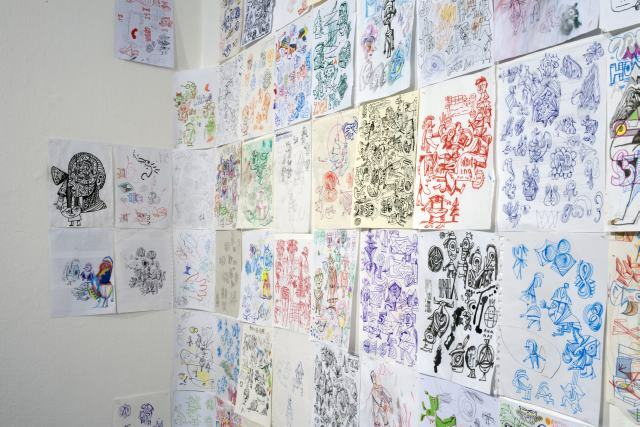 Instead of their established joint creative process, the artists set themselves the task of “a long-distance collaboration” that lasted one month. 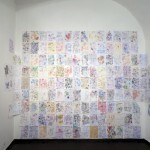 Like writing a diary entry, they decided to make a drawing every day at a certain time, each in their own home and on their own roll of paper, without looking back. 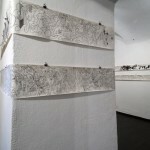 They then proceeded to bring the rolls into the gallery, unravelled them together, attached them to the wall, only to be surprised by the finding that the two drawings were actually of the same length. 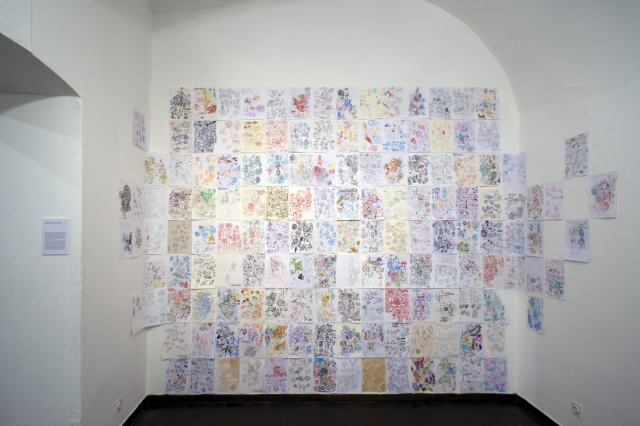 In such a way the contemporary frieze spoke of individual art practices that intertwine in terms of working style and form, as well as topic. 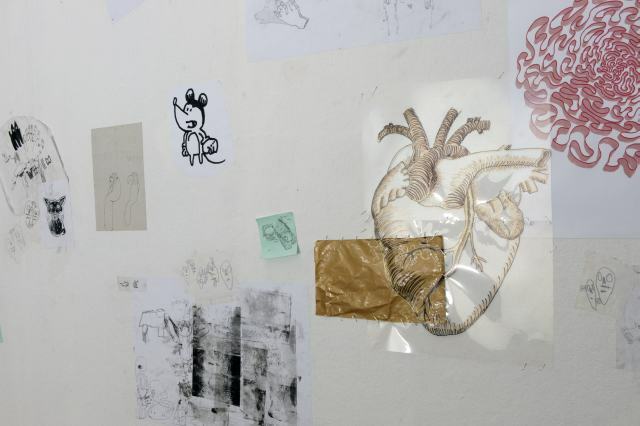 This, as well as their other, more or less, joint works, are imbued with a relaxed sense of humour, grotesque and macabre in places, through which they mock and respond to contemporary daily life. 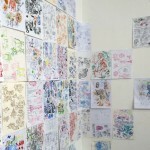 The works 8 O’Clock Drawings and 10 O’Clock Drawings by Leon Zuodar are a series of drawings, which the artist has been making since 2010 every morning with his first cup of tea; initially at 10 am, before the time moved to 8 am over the years (the older we get, the earlier we get up). 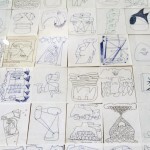 These are drawings with different motifs, since they note a variety of objects around him – the view through the window, humorous and self-ironic musings with an emphasis on the figurative, or totally abstract drawings that spring from the currents of the subconscious and automated action. 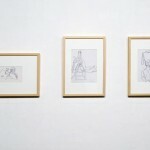 Avgust Černigoj, the founder of Slovenian constructivism and the most prominent representative of the historical avant-garde in Slovenia, was presented with an almost unknown series of drawings (1977–1979). 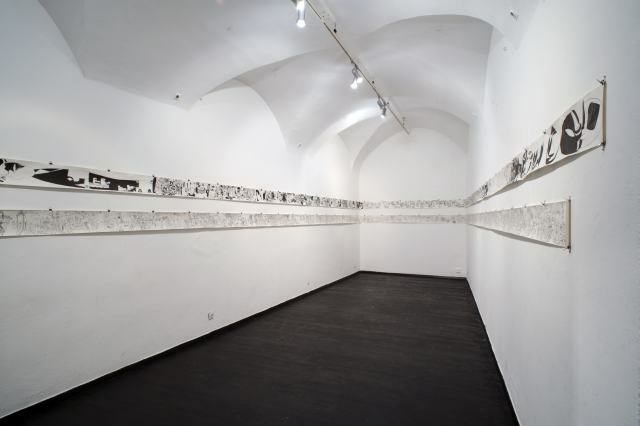 A serious traffic accident in 1975 chained him to the beds of the hospitals in Sežana and Valdoltra for several months, where he drew the daily hospital life in order to relieve his boredom. 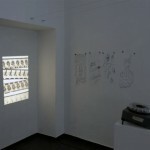 This is how the series of twenty drawings was created (a selection of ten was exhibited), in which various objects and medical instruments appear as equals to the human figure: wheelchairs, crutches, splints, physiotherapy devices, etc. 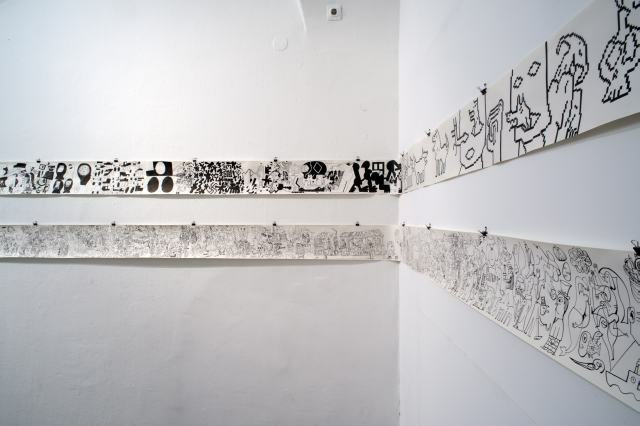 Featuring a strong contour and a simple line, the drawings resemble comic strips and have a distinctly contemporary air to them. 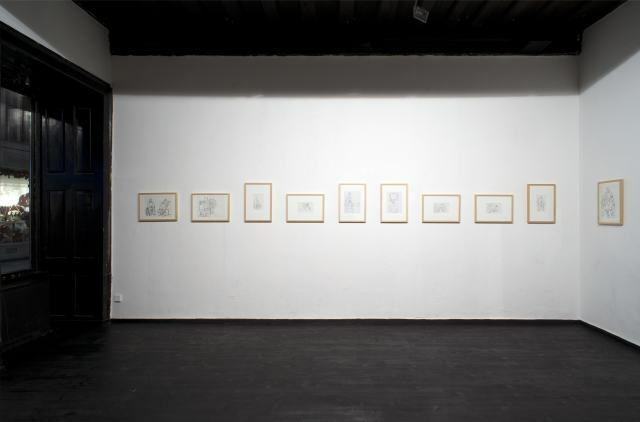 Bariş B. Atal is a Turkish artist of the younger generation, who took part in the exhibition (his first international show abroad) with his drawings. 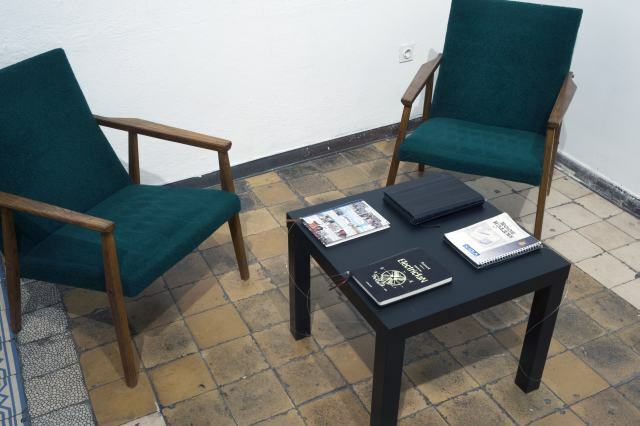 The Turkish notion of time is different to our own, as we increasingly see time as a precious resource – which is why we try to organize ourselves as efficiently as possible, in public as well as in private life. In Turkey, already the understanding of a timetable as such is much more flexible and indefinite … giving rise to a lot of waiting. In offices, at the doctor’s, on the bus (in rush hour), in the shop, in college, in meetings. 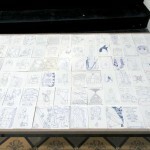 In such a way, Bariş B. Atal started to regularly record his frequent waiting at different places and at different times of day by adding drawings besides the notes, ideas and sketches in his notebooks, doing so by (always) drawing just his feet and the ground, annotating the drawings with a few brief comments in Turkish. 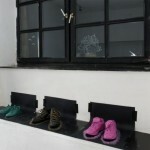 At the same time he started to draw the details in a special notebook with black paper – usually brightly coloured shoes. 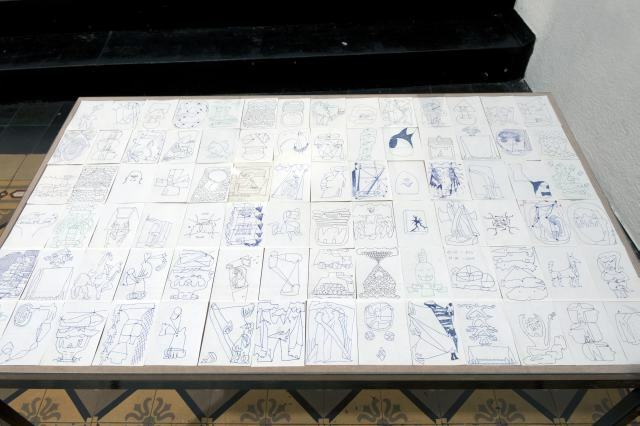 This is how three notebooks of drawings have been produced since 2013 with a joint title The Adventures of Legs, which follow his daily life, whereas by identifying the ground (the mosque, the market, the concrete ground …) we may also decipher certain fragments of Turkish culture. 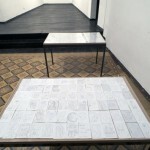 Neža Jurman set out to intervene and make changes to the work throughout the duration of the exhibition by adding or taking something away, thus using the time component to further highlighting the recording of daily life in diary form – something that the exhibition at hand set to the fore in its various ways and formats. 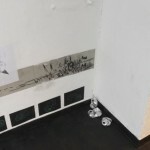 The task proved to be more difficult than expected, mainly because the first attempt in intervening in the work brought to attention the fact that she was making changes to a joint work in the absence of the Turkish artist without mutual agreement. This is why she decided to make minimal, almost unnoticeable changes. 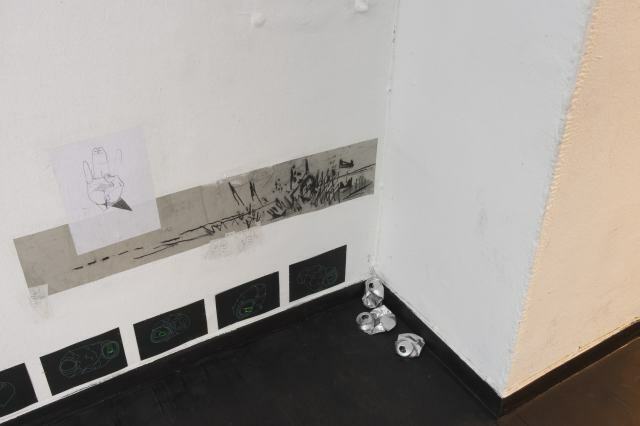 By doing so she highlighted an important point of the exhibition: a display of the simultaneity of the different creative approaches to work. 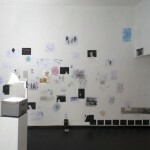 In addition to the artworks, also the ways of working and collaborating (and their results) were an important, even though less visible part of the exhibition. 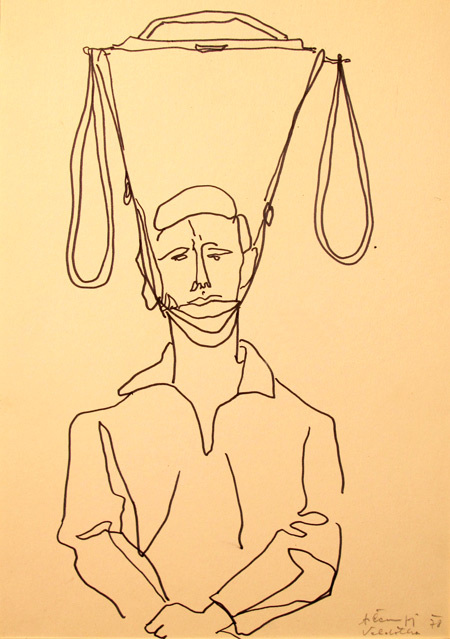 A serious traffic accident in 1975 chained Avgust Černigoj to the beds of the hospitals in Sežana and Valdoltra, where he drew the daily hospital life in order to relieve his boredom over the long period of recuperation and subsequent rehabilitation. 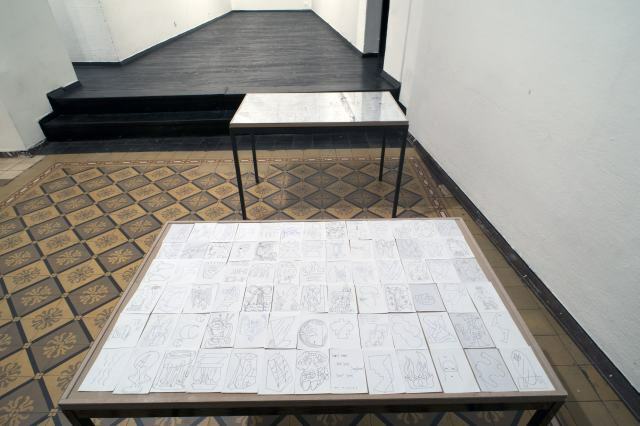 This is how the series of twenty drawings (a selection of ten is exhibited) was created, in which various objects and medical instruments appear as equals to the human figure. 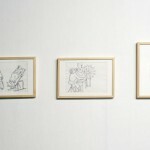 Featuring a strong contour and a simple line, the drawings resemble comic strips and have a distinctly contemporary air to them. 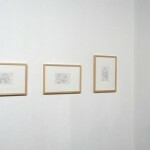 This is a series of almost unknown drawings, which are presented in Ljubljana for the first time. 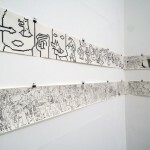 The Beli sladoled (White Ice Cream) art duo is showing a 21 metres-long drawing that was the result of their one month long drawing action, an experimental test of a different, new way of collaborating. 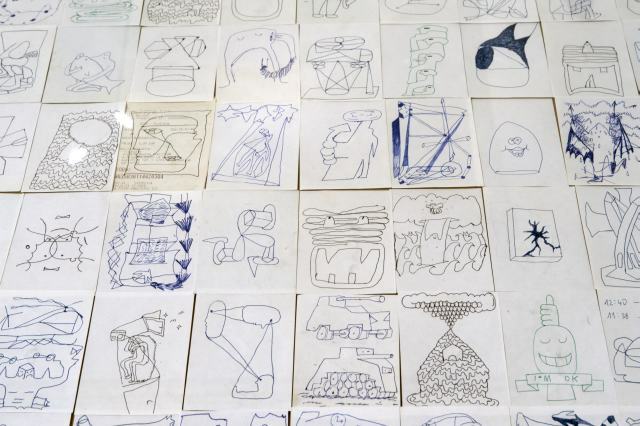 Instead of their established joint creative process, like writing a diary entry, they decided to make a drawing every day at a certain time, each in their own home and on their own roll of paper, without looking back. 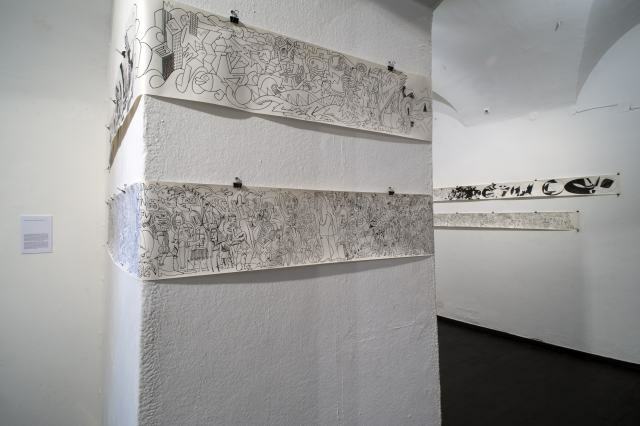 In such a way the contemporary frieze speaks of individual art practices that intertwine in terms of working style and form, as well as topic. 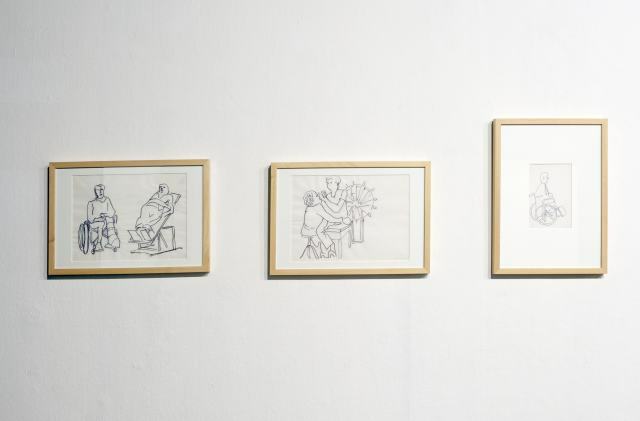 Miha Perne is exhibiting drawings that are produced in response to his daily events, ‘forcing’ the artist to work outside established frameworks. 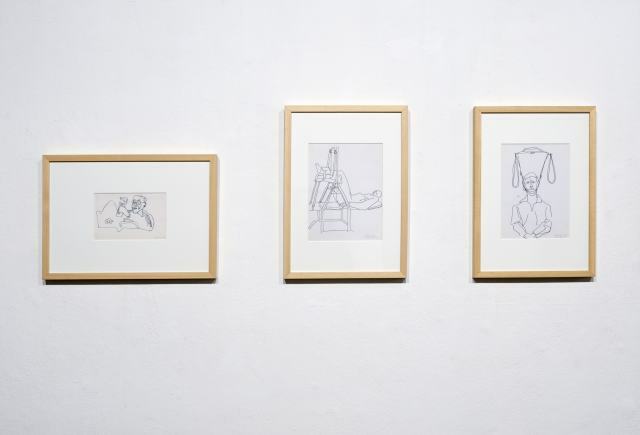 The drawings are created spontaneously every day during the course of the entire day as he steals moments from family life in his role as a father of two young children for himself in order to create (as the children watch a cartoon or take a bath, for instance). 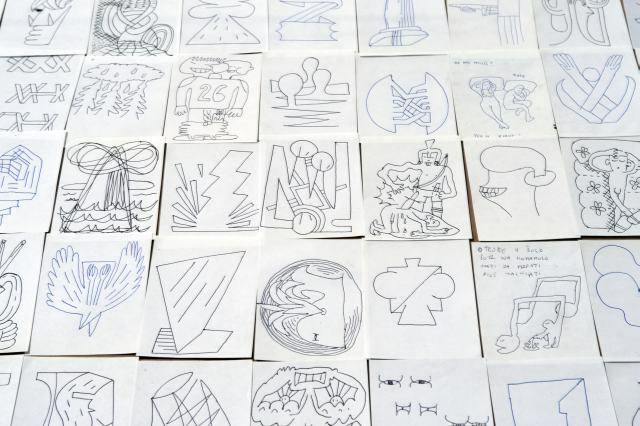 He is also required to make many a drawing according to their wishes, and sometimes even forgets a half-done drawing on the kitchen table, which the children promptly complete themselves. 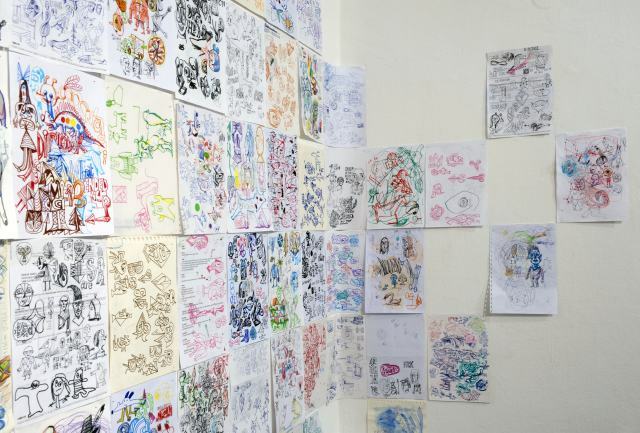 His drawings have therefore never meant to be ‘serious’ in the sense of a predetermined motif or intent like his other painted and drawn works, which he works on in a very systematic way. 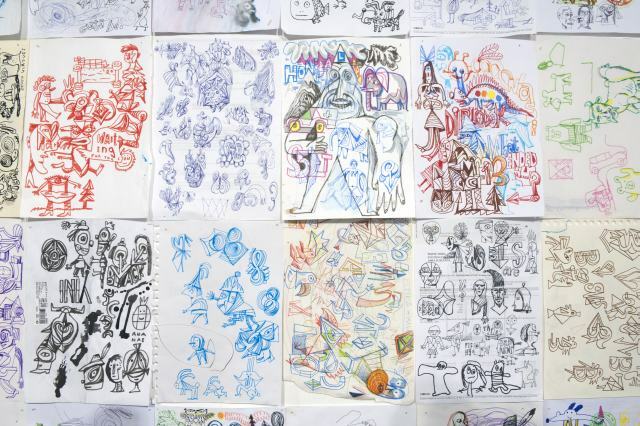 Leon Zuodar has been making drawings with his first cup of tea every morning since 2010; initially at 10 am, before the time moved to 8 am over the years (the older we get, the earlier we get up). 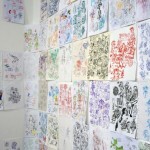 These are drawings with different motifs, since they note a variety of objects around him – the view through the window, humorous and self-ironic musings with an emphasis on the figurative, or totally abstract drawings that spring from the currents of the subconscious and automated drawing action. 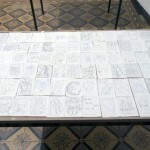 The artist started to regularly record his frequent waiting at differ rent places and at different times by adding drawings besides the notes, ideas and sketches in his notebooks. He does this by (always) drawing just his feet and the ground. 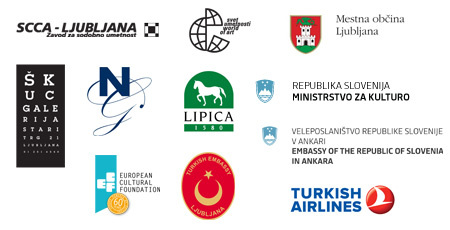 The Turkish notion of time is different to our own, in Turkey, already the understanding of a timetable as such is much more flexible and indefinite … giving rise to a lot of waiting. In offices, at the doctor’s, on the bus (in rush hour), in the shop, in college, in meetings. 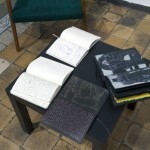 At the same time he started to draw the details in a special notebook with black paper – usually brightly coloured shoes. 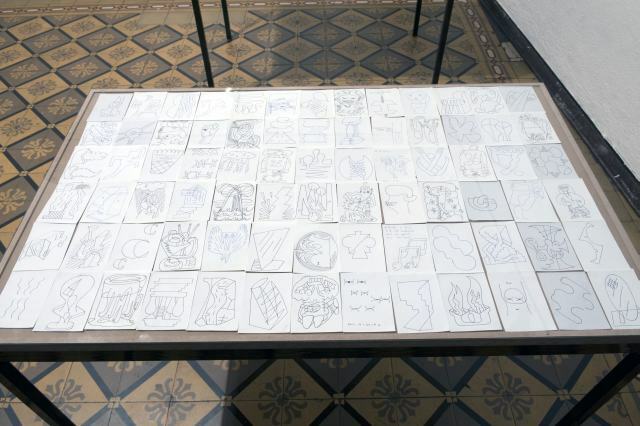 This is how three notebooks of drawings have been produced since 2013 that follow his daily life, whereas by identifying the ground (the mosque, the market, the concrete ground …) we may also decipher certain fragments of Turkish culture. 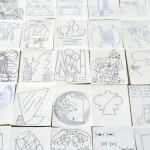 As curators, we invited them to take on a very special collaboration: a joint piece. 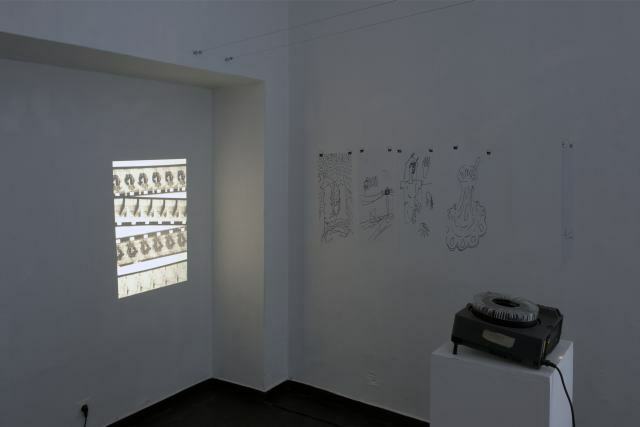 Their dialogue began in the virtual world and continues during Bariş’s two-week residency in Ljubljana before the exhibition. 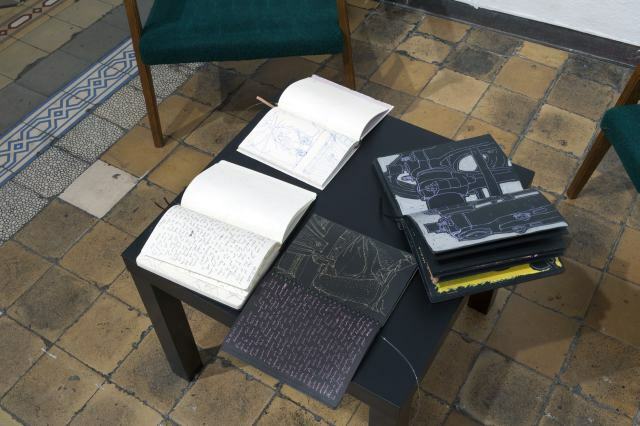 The presented work is the result of the intertwining of their practices and personal dialogue: a diary entry of their common everyday through drawing on various supports. 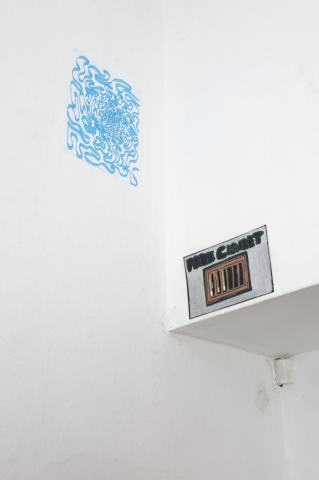 The title of the piece stems from the Slovenian phonetic record of the Turkish phrase ‘kurba virak virak’ meaning ‘žaba rega kvak’ in Slovenian or ‘frog croak croak’ in English, with an additional meaning in the title provided by the play on words which ensues in the Slovenian language and means ‘whore, devil, devil’. Born in 1987 in Izmir, Turkey. 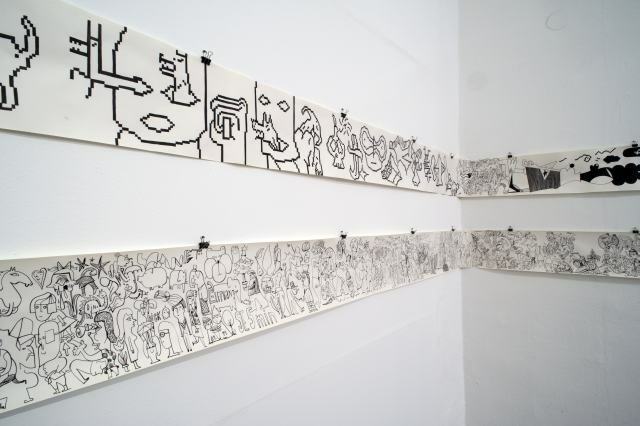 He graduated from fine arts at the Anadolu University in Eskişehir, Turkey and also participated in Erasmus Programme at Šiauliai University in Vilnius, Lithuania. 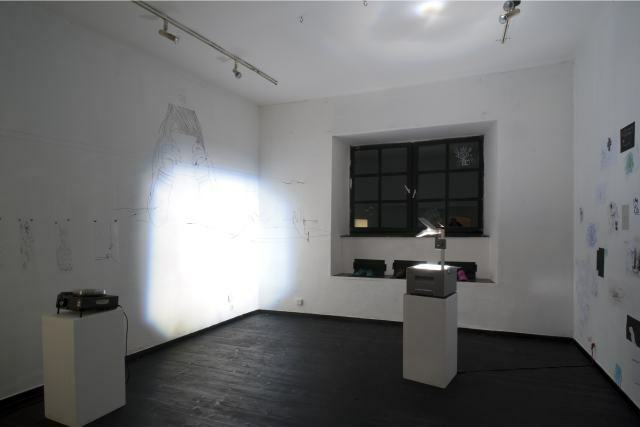 During his studies he had some group exhibitions and collaborated also in the project PORTIZMIR 3 as an assistant of Tomislav Brajnović. Born in 1898 in Trst, Italy; died in 1985 in Sežana, Slovenia. He is a legend of the Slovenian Constructivism and New-Collectivism and one of the central representatives of the Avant-garde art movements. 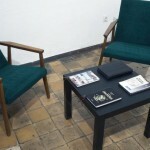 After being a student at Bauhaus School in Weimar, his art practice had gained a multi-media approach. 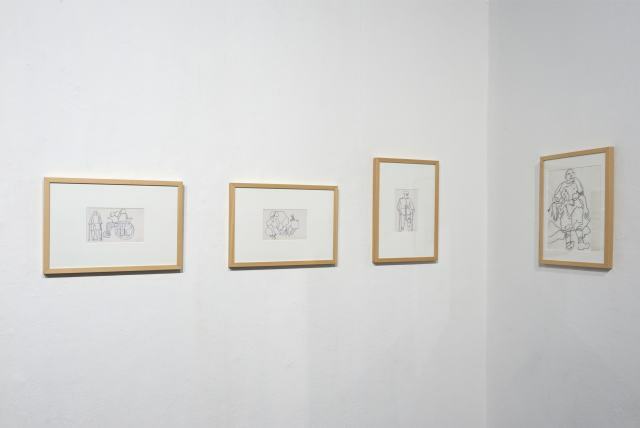 Although known mainly for his graphic works, he also made various constructivist models, paintings, stage sets, collages as well as pencil and felt-tip drawings. 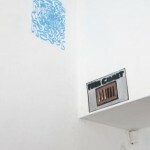 Born in 1985 in Kranj, Slovenia. 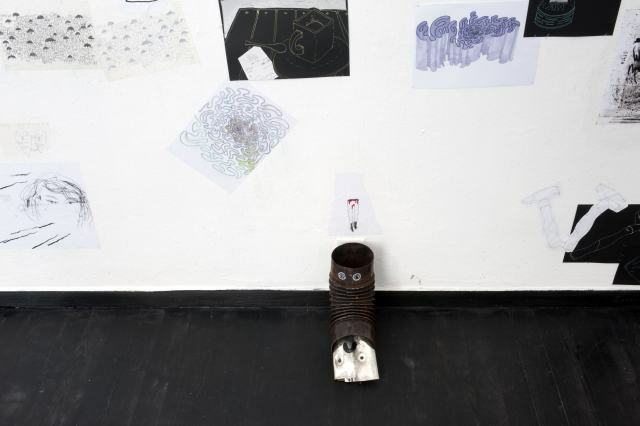 She finished graphic design at High School for Desing and Photography in Ljubljana and continued with studying sculpture at the Academy of Fine Arts and Design in Ljubljana. In 2011, she received an Acknowledgement of the Academy for special achievements in Arts and the National University Prešeren Award. 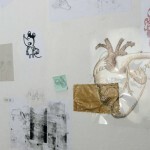 Jurman works in the field of sculpture, scenography and illustrations. 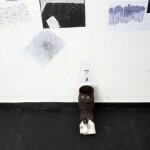 She presented her work on numerous solo and group exhibitions in Slovenia, Italy, Bulgaria and Bosnia and Herzegovina. 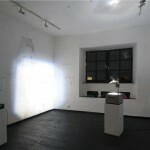 Born in 1978 in Ljubljana, Slovenia. 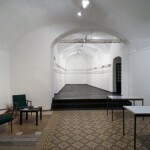 After finishing photography at High School for Desing and Photography in Ljubljana, he studied painting at the Academy of Fine Arts and Design also in Ljubljana and graduated in 2004. 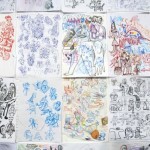 He founded art tandem Beli sladoled (White Ice Cream) together with Leon Zuodar in 2005, launched a publishing label ‘Beli sladoled books and zines’ in 2011 and they received the OHO Group Award for their work in 2011. 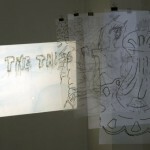 Perne works in the field of painting, graphic and comics. 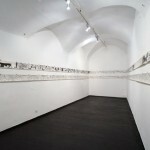 Born in 1977 in Postojna, Slovenia. 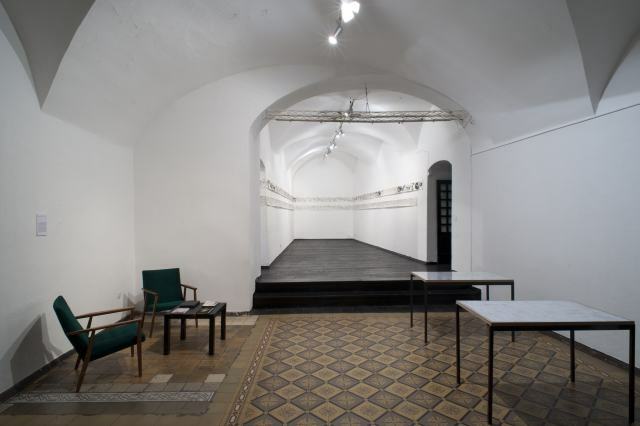 After finishing high school in Postojna, he graduated in painting at the Academy of Fine Arts and Design (Ljubljana). 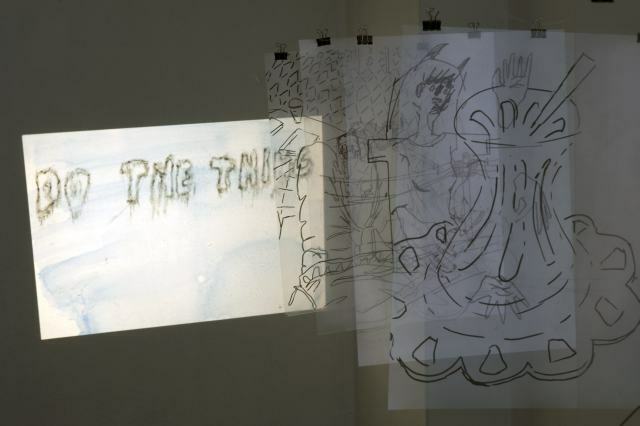 He founded art tandem Beli sladoled (White Ice Cream) together with Miha Perne in 2005, launched a publishing label ‘Beli sladoled books and zines’ in 2011 and they received the OHO Group Award for their work in 2011. 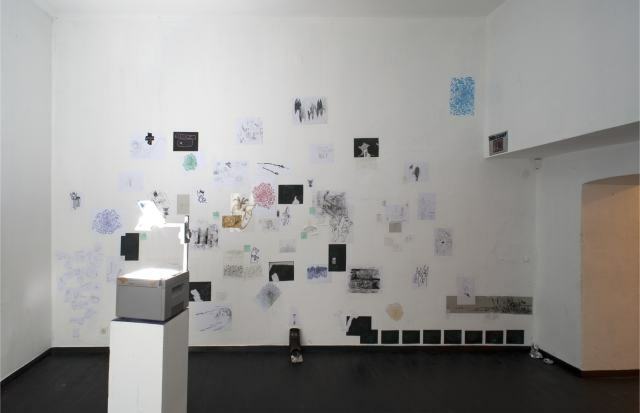 Zoudar was also a member of the Art of Asfalt art group/project (2007−2009) and has become a program co-organizer in the House of Culture Gallery in Pivka this year.